The inside of the nose is called the nasal cavity. It is actually bigger than many people think, and it has many structures inside it. At the most basic level, there is a left and right nasal cavity. The sides are separated by the nasal septum. The nasal cavity on each side opens into the nasopharynx through the choana. Vestibule: This is basically the inner nostril. More specifically, it starts on the skin of the nostril at the very edge and stops where the skin transitions into the mucous membrane of the nasal cavity. 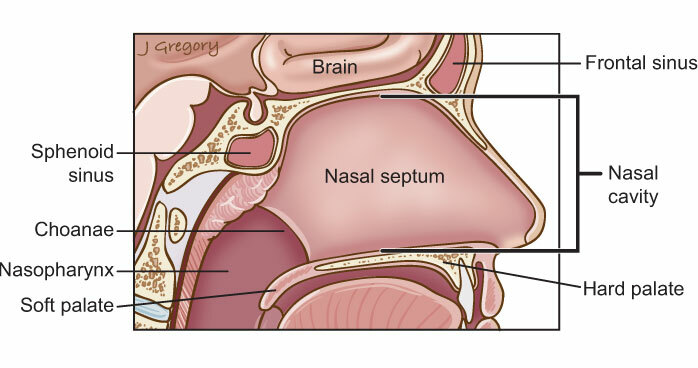 Septum: This is the wall in the middle of the nose that separates the left nasal cavity from the right nasal cavity. It is made up of cartilage and bone. At the top, it joins up with the bones of the base of skull. Floor: This is what it sounds like—the bottom part of the nasal cavity all the way back to the nasopharynx. Lateral wall: This is the side wall of the nasal cavity. It has structures on the side called turbinates (also called conchae). There are inferior (lower), middle and superior (upper) turbinates. Sometimes there is a fourth, even higher, turbinate, which is called the supreme turbinate. The lateral wall is where the sinuses and tear duct open into the nasal cavity. The paranasal sinsuses are air-filled spaces in the head. The sinuses are very closely related to some major structures. They are close to the brain, the eyes, the carotid artery, the teeth and important nerves in the head and neck area. There are four pairs of sinuses. Maxillary sinus: This is the cheek sinus. This sinus is located above your teeth, below your eye and next to your nose. There is one on each side. This is the biggest sinus. There is a little drainage hole so all the mucous made in the sinus can drain into your nasal cavity just under the middle turbinate. The maxillary sinus is the most common site for a sinonasal cancer. 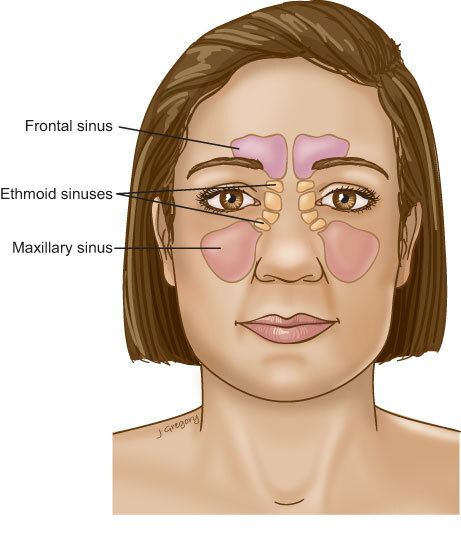 Ethmoid sinuses: This is a group of 10-20 small sinuses with very thin walls that sit basically between the eyes and the nasal septum. The eye (actually the orbit) is to one side of the ethmoid sinus, and there is just a thin piece of bone that separates the two. This, along with the nasal cavity, is tied for being the second most common site of sinonasal cancer. Mucous from the ethmoid sinuses drains into the nasal cavity, under both the middle and superior turbinates. Frontal sinus: This sinus (also one on each side) is located behind the forehead and over the eye. It drains just below the middle turbinate through a passageway called the nasofrontal duct. 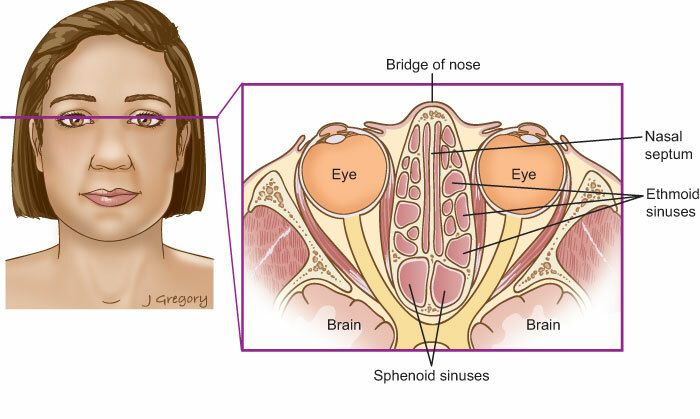 Sphenoid sinus: This sinus is located behind the nose at the base of the skull. Many important structures are found just behind the sphenoid sinus, including the brain, the nerve of vision, and the main blood vessel to the brain (the carotid artery). The mucous from here empties just below the superior turbinate into the nasal cavity.